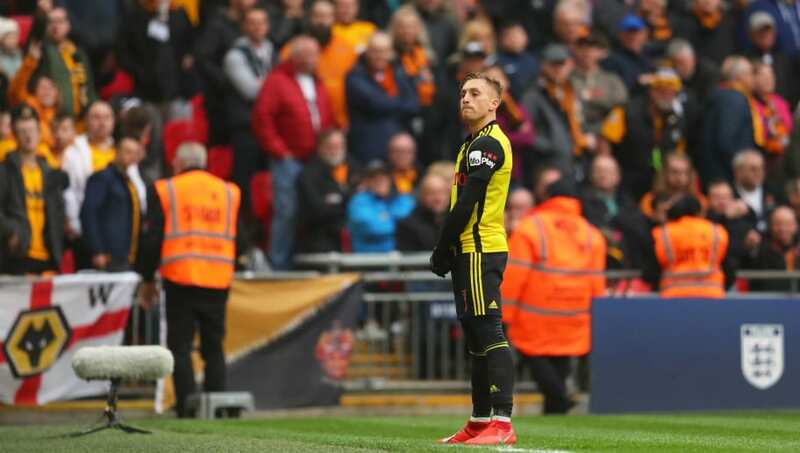 Gerard Deulofeu's brace earned Watford a stunning 3-2 win over Wolves, having been two goals down, as Troy Deeney's 94th minute penalty forced extra time in a pulsating FA Cup semi-final clash on Sunday. A nervy opening saw both goalkeepers untested, but it was Watford who carved open the game's best chance when Troy Deeney swung over a beautiful cross from the left, where Andre Gray had stayed onside, only for his dinked volley to beat John Ruddy as well as the crossbar on 32 minutes. That miss proved crucial as Matt Doherty peeled away from his marker at the back post to head in from Diogo Jota's right wing cross three minutes later. Connor Coady valiantly threw himself at another Gray effort as Wolves held onto their lead ahead of half time. After being denied early in the second period, Jimenez wasn't to be thwarted again after 63 minutes, putting breathing space between his side and ​​Watford with a beautifully taken goal. Jimenez excellently controlled a cross with his chest in the box, with that superb control allowing him to volley home smartly. Deulofeu's inclusion had the desired impact as Watford continued to press, with the Spanish winger bending a sumptuous effort into the far corner from a stand still position on the edge of the box to set up a tense final ten minutes. The Hornets sealed the comeback in the most dramatic fashion as ​Deeney fired home from the spot in the final minute of added time after Leander Dendoncker tripped the Watford captain in the box. What a finish from Deulofeu, who finds the bottom corner after Gray's pass. Deulofeu completed the turnaround 14 minutes into extra time with a low effort beyond Ruddy after a neat give-and-go with Gray. It set up a grandstand finish where Wolves threw everything forward, however the Hornets stood firm to set up an FA Cup final date with Manchester City next month. It was a big call from Javi Gracia to leave Gerard Deulofeu out of the starting lineup in favour of Gray, and the manager will have been ruing that decision when the latter spurned two glorious opportunities either side of Doherty's opener. A tactical reshuffle at half time was required, but came too late, as they were undone by a piece of magic by the Wolves number nine. Deulofeu's inclusion had hoped to spark life into Gracia's side, moving away from the midfield diamond, with the Spaniard producing the kind of magic his side so desperately needed with ten minutes remaining to give his side hopes of a dramatic finale. It duly arrived, in added time with 'Mr. Watford' Deeney forcing extra time with his stoppage time penalty, something their bombardment of the Wolves goal arguably deserved. The most remarkable of comebacks was completed in extra time when a certain Spaniard skipped past Coady and calmly passed the ball past Ruddy to spark jubilant scenes. They held on for a memorable victory to set up a giant clash with ​Manchester City in the FA Cup final next month. Without Deulofeu in the side, Watford struggled getting in behind their opponents and his replacement Gray wasted two glorious chances to get his side a goal to leave many questioning Gracia's decision. His energy fed life into Watford's resurgence, as they threw everything forward trying to force their way back into the game. His goal was world-class and gave the Hornets the platform to seal their late equaliser. The icing on the cake coming when he netted the winner with just the kind of piercing run that his side lacked until his arrival. Injury forced him off late on, but his work was already done. The work Santo has achieved with ​Wolves this season has been sensational, building a side that were never in fear of relegation, instead contesting in an FA Cup semi final and a top seven finish in the Premier League. Sunday's clash was anything other than straightforward though, after finding themselves in front with 11 minutes remaining, the manner of the finish will have disappointed Santo. Deulofeu's strike was one of pure class, but Dendoncker gave away a needless penalty in added time that Deeney made no mistake in dispatching, as their two goal lead vanished before their eyes. In a first half where Watford saw most of the ball, Jota was often isolated in forward areas alongside Jimenez, yet his tenacity and work rate embodied the team spirit that Santo has instilled into his Wolves side. Jota's pinpoint cross for Doherty handed his club the initiative, with the Portuguese forward a constant thorn in the Hornets' side, producing menacing runs throughout and driving with the ball whenever possible. Just look at the tenacity of Jota there. Three tackles before he brings a man down with his fourth challenge, all in the space of five seconds and five yards! It's back to Premier League action for both clubs after Sunday's game. Watford stay in London as they host Arsenal at Vicarage Road on 15 April. Wolves are on their travels again as they head to the south coast to take on Southampton at St. Mary's.